The German (Saxon) heritage in the Southern Transylvania includes preserved cities and villages, with specific architecture. The Saxons came in Transylvania around 1100 from Rin and Mosel Rivers areas. Thanks to their skills and talent, the Saxons developed unique culture and architecture in this part of Europe. They built the famous fortified churches in the 13-15 centuries. Seven of them and Sighisoara citadel are now included in the UNESCO world heritage patrimony, thanks to their preservation. The locals also preserved their old traditions and skills. In our tour are included the most important Saxon objectives, but also other local attractions, which will offer you a taste of the local life. Group meeting with the guide. In the first day we will go toward our first objectives in Transylvania. On the way we will admire the mountain resorts on Prahova Valey. 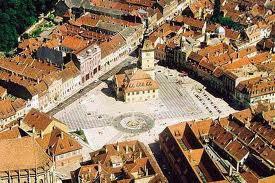 At Prejmer, near Brasov, we will visit our first important objective - the strongest fortified church in Transylvania. This beautiful church was included in the UNESCO patrimony due its perfect preservation. After lunch we will arrive in Brasov for check-in and for a walk tour before dinner. Brasov is one of the "7 fortified cities in Transylvania" (Siebenburgen), and currently one of the most visited cities in Romania. We will visit the Black Church, the Council Square, Schei Gate, the Guilds fortified towers. Dinner and accommodation in Brasov. Buffet breakfast at Hotel. Today we will visit fortifications and churches in Barsa region and we will end the day at Sighisoara - the citadel included in the UNESCO patrimony. In the morning we will visit Rupea fortification - currently renovated. Then, we will visit the rural site Viscri, including the fortified church. Herem we will visit local crafts and we will taste the local products. On the way to Sighisoara we will also visit Saschiz fortified church. In the evening we will check-in at Sighisoara and will have a short walking tour of the citadel before dinner. The tour will include visits to the guilds fortified towers, the wooden stair and the birth place of Vlad the Impaler. Dinner and accommodation in Sighisoara. Buffet breakfast at Hotel. In the morning we will continue our visit in Sighisoara citadel. We will visit the Clock Tower, the Weapon Museum and the Torture Chamber. We are leaving Sighisoara for visiting another UNESCO site - the fortified church in Biertan. This beautiful church was the first Romanian objective included on UNESCO world heritage list, in 1993. In Biertan we will have a medieval lunch, near the fortified church.After lunch we will visti Mosna - a village where we will visit an ecological farm. We will spend the evening in a small Saxon village, where the old houses are renovated and transformed in comfortable guest houses, but the old Saxon traditional architecture is still preserved. Dinner in the village, including wine tasting. Buffe breakfast at the local inn. After breakfast we will visit the village and few old houses which currently are transformed into guest houses. We are leaving the small village for visiting other Saxon objectives. We will cross Medias - another fortified city included in the "Siebenburgen" list and the fortified church in Valea Viilor. We are heading Sibiu for lunch and check-in. After lunch we will have a walk tour of this beautiful city, which in 2007 was the European Cultural City. The cultural events and its bohemian live transformed Sibiu into one of the most visited cities in Romania, especially by foreign tourists. Farewell dinner in the old city center of Sibiu. Accommodation in Sibiu. Buffet breakfast at Hotel. Today we will return to Bucharest, but not before visiting other cultural and natural attractions. On the Olt River valley we will find Cozia Monastery, for experiencing another type of architecture. Nearby we will find Hurezi Monastery - also included in UNESCO patrimony. After lunch we will visit Horezu traditional workshops, well known for its ceramic products. In the evening we will arrive in Bucharest. End of tour. For groups of more than 15 persons, the price will be adjusted according to the number of participants.